San Francisco-based Pacific Gas and Electric - PG&E - has been in the news lately and it has not been without reason. In the aftermath of the devastating 125,000-acre Camp Fire, which as of this posting has claimed 63 people, that started in the Butte County community of Paradise focus has slowly shifted to determining the cause of the disaster. Initial information suggests the fire may have been caused by poorly maintained PG&E transmission lines. PG&E's reputation, and stock price, has been hammered as a result of this, the San Burno residential explosion, and other wildfires that have ravaged the state that has been in-part blamed on their alleged poor maintenance practices. While PG&E has been scrutinized in the last several years, it is worth remembering other cases where they were found liable for wildfires. One such incident happened 24-years ago in Nevada County in the relatively small 500-acre Trauner Fire in the community of Rough and Ready. 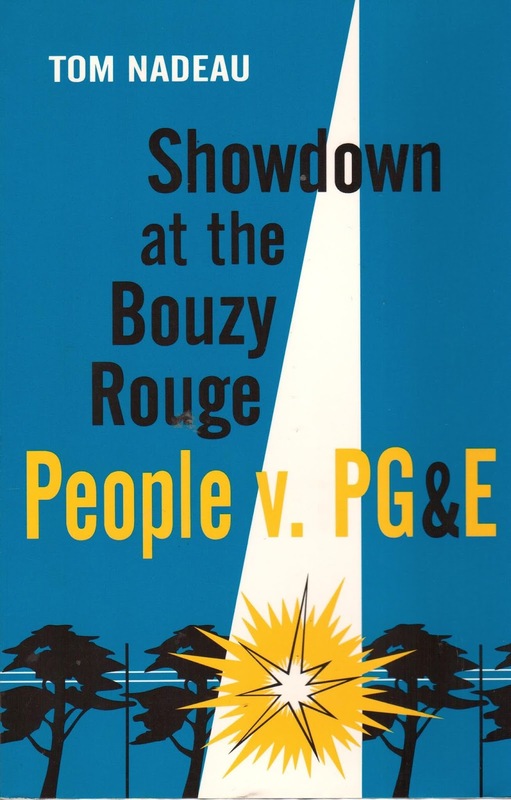 The event is documented in the 1998 book by one-time EGN contributor, and author, the late Tom Nadeau, Showdown at Bouzy Rouge, People v. PG&E. While the 500-acre Tauner Fire, which destroyed 12 structures and caused an estimated $3 million in damages, was a forgettable event in the history of California fires, especially compared to those in the last few years, the aftermath may have great significance given events surrounding the Camp Fire. What makes this fire noteworthy was that Nevada County, the birthplace of PG&E ironically, successfully prosecuted the utility on 739 misdemeanor criminal charges. In the center of Nadeau's Showdown at Bouzy Rouge, was a David versus Goliath story. Casts as the David was Nevada County associate deputy district attorney Jenny E. Ross, who was the sole attorney in the special prosecutions unit. The Goliath was the army of big city attorneys hired by PG&E to defend, in Nadeau's words, "the nation's largest investor-owned utility from the ignominy of criminal prosecution." From the time of filing the lawsuit in July 1996 until a verdict was delivered in June 1997 after a three-month trial, Nadeau, who at the time was a colleague at the Daily Recorder in Sacramento, covered the entire pre-trial and trial proceedings and provided gavel-to-gavel coverage. When Nadeau started his coverage, he was the only member of the media present, but by the end of the proceedings, which was held in an overflow courtroom in Nevada City's Bouzy Rogue saloon, had attracted international attention. In the final verdict, the jury in the municipal court trial found PG&E guilty of 739 of 743 charges, with a hung verdict on four counts. In simple terms, the utility giant was found guilty of letting tree limbs to grow to close to power lines in violation of California Public Resources codes 4292 and 4293. In the epilogue to the book, which was published in 1998, Nadeau noted after expenses the county barely broke even from the fines they collected from PG&E. As for the damages to the property owners in Rough and Ready, PG&E pushed the settlement on a tree-trimming subcontractor and paid fines to the California Department of Fire totaling $1.25 million. Also of note, given Ross' successful prosecution, several other rural California rural counties at the time explored the idea of pursuing legal actions against PG&E. Among those counties was Butte, where the state's mostly deadly fire started just over a week ago. Nonetheless, had PG&E executives then and today prioritized the safety of people instead of shareholders following the lessons at Bouzy Rouge, the Camp Fire might have been averted. I was always amazed at how much money PG&E pours into political campaigns, now I know why. After free-falling for a week, the stock price of PG&E is up over 36% this morning. What do the investors know that we don't?